'a soft spongy spot'. The town is called Maothail Manachain from St. Manachan who founded a monastery here as early as 500 AD. The site was where the Church of Ireland stands today and it probably stretched across the river to where the Carolan Home now stands. Every monastery had a church, school, mill, house of hospitality, little huts for the monks etc. 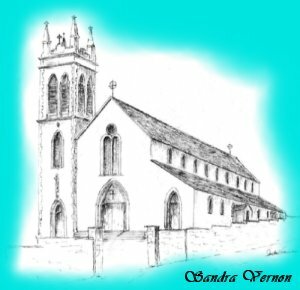 The only remaining memory of St Manachan was, until recent times, the big fair called Monaghan Day, held in the town on Feb 25th each year. "In the early 1200s the monastery was taken over by the Augustinian Order and they remained in charge of the monastery until the monasteries were closed in the time of King Henry VIII in the sixteenth century. The monastery and its lands eventually passed to the Crofton landlord family as well as the town of Mohill and a large portion of the surrounding country. The Crofton family held those lands until the early part of the 20th century. The Clements family (Lord Leitrim's family) owned various townlands in the parish of Mohill but it was the Crofton landed family who owned the town. The principal family name around Mohill was Mac Raghnaill, later anglicised to Reynolds. The family sprang from the ancient tribe known as the Con Maicne Moy Rein. Raghnall ( from the Norse, Reginald ), was probably an important family name at the time surnames came into use - about the time Brian Boru was fighting the marauding Danes. The districts of Eslin and Gorvagh are part of the parish of Mohill. The parish (19,000 acres) is the biggest in the diocese of Ardagh. There are 127 town lands on the Ordnance Survey map and the population of the town is about one thousand while the rural division holds about another thousand. Hyde Street gets its name from Rev Arthur Hyde who was a Church of Ireland minister in Mohill from 1816 until 1870, 54 years. This Arthur Hyde had a son, also Arthur, who became a Church of Ireland minister and he had a son named Douglas. Douglas was born at Kilmactranny, Co Sligo, but brought up at Frenchpark, Co. Roscommon. This is the Douglas Hyde who figured in Irish history as the founder of the Gaelic League in 1893 and who was elected President of Ireland in 1938. Douglas spent a lot of his boyhood years around Mohill. The Hunt Hall is called after Rev Fitzmaurice Hunt who succeeded Rev Arthur Hyde and was married to his, daughter. The present Catholic Church, St Patrick's, was built in 1885 and the spire was added in 1936. 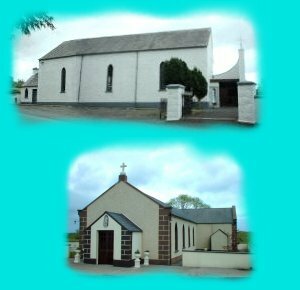 The church was built when Canon Donohue was parish priest of Mohill. It was also Canon Donohue who had the residence of the parish priest erected. The first Sisters of Mercy came to Mohill in 1879 and the present convent is sited close to the site of the old church. 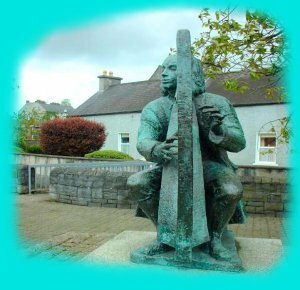 Turlough Carolan (1670-1738) was a great composer of musjc for the harp. .He lived at Mohill when he married Mary Maguire of Tempo, .Co Fermanagh about the year 1720, and it was here his family was reared. He was blind and made his living by playing the harp and composing musical pieces at the houses of the rich. A statue to his memory was erected at the lower end of the town and was unveiled by Dr Hillary, President of Ireland, in August 1986. The workhouse was situated where the creamery now operates. It was built by the Eng!ish government in the early eighteen forties and was intended to give shelter and food to the homeless. It had accommodation for 800 but during the Famine (1845 - 47) it held far more than that. It was a harsh place and many died there. Those who had no one to take their remains' were buried in a little plot not far away called Bully's Acre. The Night of the Big Wind did not do as much damage to the town of Mohill as it did to other towns. It took place on Sunday evening, 6th January, 1839.
of the exact year when Gorvagh R.C. church was built but we are told that it was built on a site given by Lord Leitrim who owned the town lands in this district. There was also a R.I.C. barracks here. There were two schools in this district also, Finiskill and Stracarne. They were amalgamated with the schools in Mohill in 1975. The train, known as the Narrow Gauge, ran past Mohill where it had a stop. 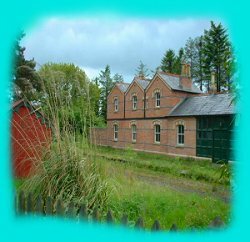 Mohill railway station house and offices are still standing and are in good repair. The Narrow Gauge line reached Mohill from Dromod in 1887 and continued towards Ballinamore and Belturbet. It was especially useful on fair days for transporting cattle towards the North of Ireland and towards the Midlands. It closed in 1959. The iron rails and wooden 'sleepers' were sold. The R.I.C. barracks for Mohill town was situated in Glebe Street where Gilmartin's butcher shop now does its business. Mohill GAA club was called the Faughs (Fag an Bealach). Eslin club was called 'Sarsfields'and Gorvagh GAA club was called the 'Brian Borus'. Gorvagh is the only club to win 'four-in-a-row' in the Leitrim ( senior ) G.A.A. County Championship. It won in 1924, 1925, 1926 and 1927. Mohill won the first Co Championship in Leitrim in 1890 and Eslin won the second in 1891.